Ecogrid has developed a permeable paving grid that promotes the natural movement in horses, this is achieved through it’s high degree of elasticity and the good grip that offers the horse an excellent reliable ground surface. The extreme impact loads from the horse’s hooves are especially well absorbed. 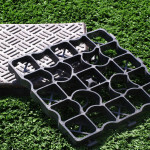 Conventional ground grids with straight bars stay rigid when loaded. Ecogrid has over 200 curved bars per m2 which provides more elasticity. The elastic bars always resume their original shape, are crack-proof and withstand frost at a maximum of -65 degrees Celsius and can also withstand extreme heat. Ecogrid has a load capacity of up to 350 t/m2 with over 200 expansion elements per m2. 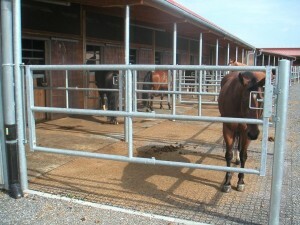 With this system, physical movement is rendered more pleasant and allows horses to become more motivated. By using an appropriate tread layer, you can boost this effect even further.